Add-on the apply customize for selected user roles on My WP. You can possible to apply customize for your selected user roles group and easy-to-use. This add-on is free. Please download the GitHub https://github.com/gqevu6bsiz/mywp_addon_select_user_roles. Please download the latest version of My WP Add-on Select User Roles. Unzip the download file and upload the entire mywp-select-user-roles to the /wp-content/plugins/ directory. 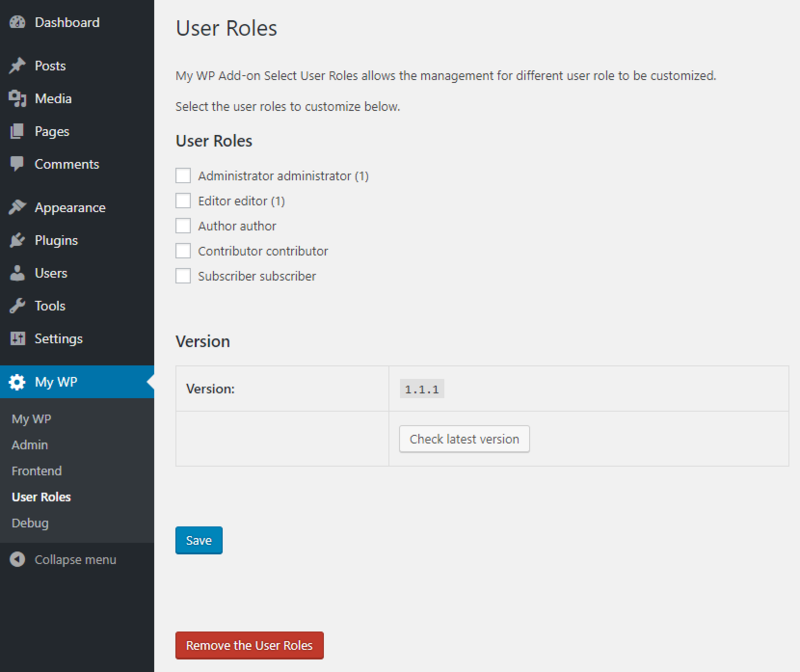 You will find User Roles child menu in My WP of your WordPress admin panel. could you tell me your problem details? it is great that I can specify certain the admin user role as well. But what to do if I have 2 admins and only want to hide things for 1 admin? But do you have something like a “superadmin” for a non multisite install? Why do I ask for? Well, I have a plug-in installed, which has only “admin” rights, which I need to give access to an author. My WP Customize and this Add-on is not have your said feature(superadmin for singlesite install). But I think there two ways. 1: Sub admin similar to admin. Create a user roles group “sub admin” to grant the same feature as admin. And you can customize for sub admin. You can custom filters for specific admin after My WP Add-on Select User Roles.